Worrying is something that everyone does from time to time, but if you are frequent worrier, you know that it is very mentally exhausting. However, do not dismiss your worrying just yet because you can actually turn it around and start using it to your advantage. 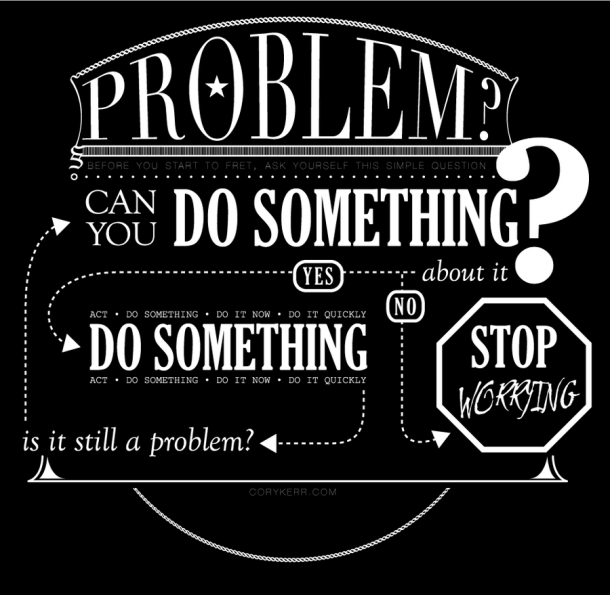 Did you know that your propensity to worry actually means that you can learn to be an effective problem solver? Most people are not aware of this, but with the right techniques and a little practice, you can take your worrying and make yourself a problem solver who can tackle any issue. Remember that your mind is powerful and you truly do have full control over how you think and feel. The key is knowing how to gain this control and maintain it during times when you are under stress and not feeling as confident as you normally do. When you can write something down and read it back, it allows you to gain some perspective over the situation. When you can establish a perspective, you are automatically taking the power away from the situation and giving it to yourself. When you write down your worries, make sure that you also write down exactly how this worry is making you feel. You need to identify your emotions so that you can start turning them around into the positive emotions that are going to help you solve the problems that are causing you to worry in the first place. Positive affirmations are incredibly powerful and they are a perfect trick for turning your worries into something that can actually help you. For example, if you are worried that you are not going to do well in your upcoming presentation, tell yourself that you are going to exceed your own expectations. Once you are in a positive mindset, you can review your presentation with an open mind and find any problems that may exist. This allows you to solve any problems because they even have the opportunity to happen. Sometimes you just need a short distraction to alleviate your worries and then approach the situation again, but this time with an open mind. Remember that one of the biggest keys to problem solving is looking at a situation openly and without any clear bias. When you are worried, your focus is on the negative things that can happen, clouding your ability to truly solve problems. However, taking a short break to read, take a walk or do something else distracting reduces your worrying, ensuring that it does not negatively affect your judgment. Sometimes the smallest things can cause an intense amount of worry and simply asking yourself if worrying is even warranted allows you to alleviate the negative thoughts and feelings. Ask yourself out loud if the situation is something you need to worry about. Even if the situation warrants worrying, this gives you a chance to truly evaluate what is happening, putting you in a better position to solve the problem. If you should not even be worrying, this is a quick way to put the situation behind you so you can focus on more important things. Sometimes you need to get the perspective of another person to see how much worrying a situation really warrants. Remember that things that are out of your control can cause a lot of worry, but sometimes you need someone else to remind you that it is not your problem for you to finally realize this. Another trusted person can also help you to better ascertain how big an issue truly is so that you can dedicate the right amount of energy to it. Now that you know that worrying is not always a bad thing, it is time to take your worries and use them in a more positive light. You will not go from frequent worrier to problem solver overnight, but if you dedicate the right amount of time and effort, you will find that you are gradually getting better at solving problems. As an added benefit, those worries will soon not be so prominent and you will star to naturally just go into problem-solving mode instead of being forced to be stuck in a mode of constant worries.